Rainfall of between 150-250mm expected in 24 hours. SCHOOLS across much of Queensland will again be shutdown as Premier Annastacia Palaszczuk and emergency services instruct anyone in the path of deadly storms to stay inside. The storm is expected to hit south-east Queensland through Thursday night and into Friday morning before it heads east out to sea. The Premier said schools would now also be shut down on Friday in an effort to keep people off the roads. "That is why we took the unprecedented step of closing schools," she said. "That is why they will remain closed tomorrow." More than 2300 facilities including state schools, independent and Catholic schools plus childcare centres will be shut down today and tomorrow. She asked all those in affected areas to "please stay in your home." Ms Palaszczuk paid tribute to the communities in the north already stricken by ex-Cyclone Debbie, saying "we are with you as well". "I saw first hand the the damage she has inflicted on our beautiful towns that have now been devastated. "We're getting in the water supplies that are needed but severe weather conditions are hampering that effort." Police Commissioner Ian Stewart said the south-east and other parts of the state were facing "waves of wind and rain". 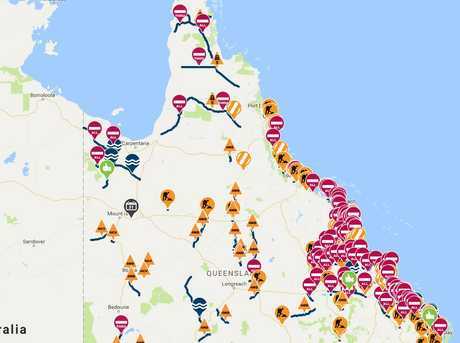 ROADS are flooded, schools are closed, and businesses are being warned to shut at noon as heavy rain brings up to 500mm to southeast Queensland. All schools from Agnes Water to NSW are closed, including Catholic and independent schools, and police are warning businesses "should think about closing after midday". All children who are already in school will be taken care of throughout the day, but parents who are able to pick their children up earlier should. Some kindergartens and long daycares may be planning on closing early, so check with individual centres. 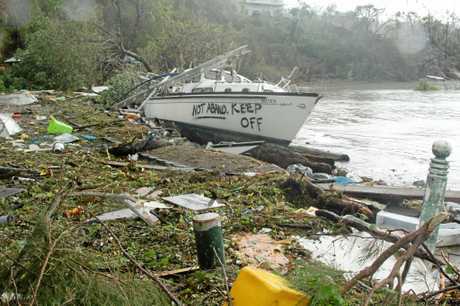 All non-essential public servants have been sent home, Deputy Premier Jackie Trad says. All beaches from Mackay to the Gold Coast are closed. Public transport in southeast Queensland will be free from 10am. "Peak hour will probably be a nightmare this afternoon," Ms Trad said. Employers should consider staggering the times at which people are released from work, she said. "We can't afford to have young, inexperienced kids walking home when there is flash flooding around," Police Commissioner Stewart said. Mr Stewart reiterated the calls for employers in the southeast corner to consider closing by midday today. Cars have been swamped by floodwaters on the Gold Coast after torrential rain. A car park at Robina is underwater, with cars submerged up to the windows. The Hinze Dam is at 107 per cent capacity and water is tumbling over the spillway. Southeast Queensland is awash, with parts of the Gold Coast receiving almost 300mm of rain over the past 12 hours while the worst is yet to come for Brisbane. In the Gold Coast Hinterland region more than 287mm has been recorded at Numinbah and 267mm at Upper Springbrook since 9pm on Wednesday while at Brisbane Airport 56 mm has fallen, including 21mm, since 7am. Bureau Of Meteorology forecaster Julian De Morton said it's bleak outlook for remainder of the day with the sun to remain hidden behind a massive cloud mass which is drenching the southeast. He said inland areas between the Sunshine Coast and Brisbane have been the most heavily affected so far with Woodford receiving a 187mm drenching and Mt Nebo recording 126mm since 3am. "There is a fair bit more to go in southeast Queensland," Mr De Morton said. "We've got one band (low pressure system) in the eastern parts of Capricornia District moving into the Wide Bay Burnett District and then we've got a secondary area of convergence which is causing another area of heavy rainfall around southeast Queensland. "Basically, it will be cloudy all day and wet and we'd really like people to adhere to the weather warning." He said there would be falls averaging 150mm to 200mm across southeast Queensland but some areas would experience falls well in excess of that. Other major rainfalls in southeast Queensland since 5am include 64 mm at Beerburrum, 40mm at Archerfield, 74mm at Tewantin and 28mm at Coolangatta. Several roads including busy Somerset Drive at Mudgeeraba have been closed due to flooding. Lifeguards are assessing beaches but the large swell predicted from ex-Tropical Cyclone Debbie is not expected to hit until tomorrow. Four dams are now overflowing. - Wyaralong Dam is at 100.6 per cent capacity. Maroon Dam and Moogerah Dam is also almost full. 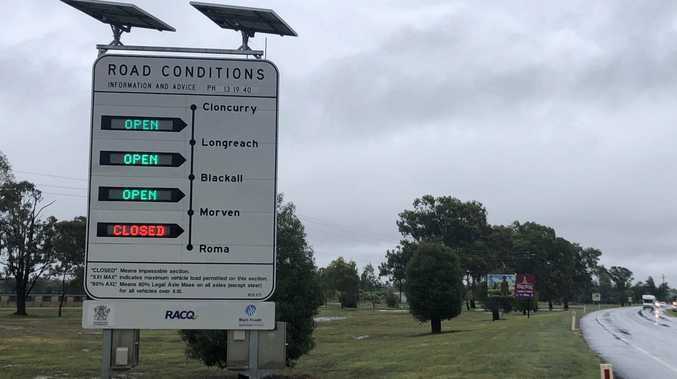 Queensland's cyclone emergency is far from over as a rescue operation continues near Mackay and the state's southeast faces flash flooding, the premier says. Annastacia Palaszczuk was heading back to Brisbane on Thursday after visiting areas hit by the category four Cyclone Debbie earlier this week. She will attend emergency meetings about the crisis that's forced the closure of every single school in the Queensland's southeast corner. The government made the call early on Thursday after hearing the rain depression that used to be Cyclone Debbie could dump about a month's worth of rain over the region in the next 24 hours. 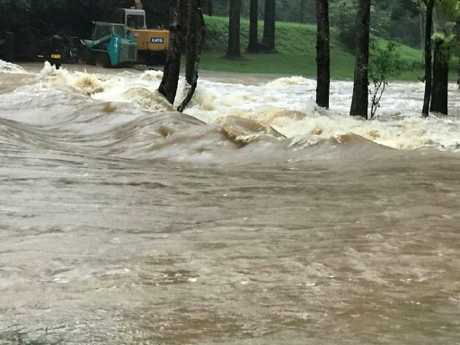 Bureau of Meterology senior forecaster Matthew Bass said it was difficult to model for flash flooding because predictions were based on the intensity of the rainfall. "What we do know, though, is that we're expecting those heavy falls in a short duration of time," Mr Bass said. "We've already seen some of those this morning - particularly in the Gold Coast hinterland." Mr Stewart warned anywhere between 400-500mm of rain is predicted to fall on southeast Queensland. "Do not underestimate the power of this rainfall," he said. UP to 30 people are desperately waiting to be airlifted outside of Mackay as ex-Cyclone Debbie delivered a "horrendous" situation in Central Queensland overnight, with south-east Queensland likely to face the wrath of the storm later today. Rising floodwaters at Eton, west of Mackay, meant emergency services were plucking striken residents from rooftops and cars. The violence of the weather means many are still stranded as emergency services rush to send helicopters into the area. Queensland Fire and Emergency Services Commissioner Katarina Carroll said the wind and rain was hampering operations. At first light on Thursday, she said rescue teams would "get across" the situation and begin reacting. Meanwhile the dying former cyclone is preparing to dump huge amounts of water on the southern parts of the state, as emergency services warn south-east Queensland to pick up the kids early and leave work as early as possible today. Close to 700 homes on the Sunshine Coast have already lost power, particularly in Witta, Maleny and Doonan. While the expected total rainfall remains between 150-250mm throughout the warning area, BOM meteorologist Matthew Bass said much of the south-east should prepare for 200mm to fall in the coming 24 hours. The rate of rainfall is to worsen this afternoon, although parts of the Gold Coast Hinterland have already copped more than 180mm in just three hours. The Sunshine Coast hinterland and other higher-altitude areas are expected to cop more rain and wind than their lower-lying counterparts. Queensland Police Commissioner Ian Stewart said south-east Queensland should shut down by lunchtime. "Those levels of rain we probably haven't seen for a number of years," he said. "We must take action now. "It's going to be too late by mid-afternoon in south-east Queensland. "If you're living from Mackay south -- please, you have to think about what this means in your area and be preparing yourself for that. THE Bureau of Meteorology has issued a severe thunderstorm warning for most of eastern Queensland, as Cyclone Debbie moves south and begins its assault on the south-east. Severe thunderstorms are likely to produce very heavy rainfall that may lead to flash flooding in the warning area over the next several hours. Locations which may be affected include the McPherson Range, Springbrook, Numinbah Valley, Little Nerang Dam, Tallebudgera and the area south of Canungra. Disaster teams and dam ­operators are on high alert, swiftwater rescue reinforcements are arriving from interstate and sandbags are ready as the sodden southeast Queensland faces another drenching in the wake of Cyclone Debbie. Only a week after the last deluge that sent some dams spilling over, the region is ­bracing for hundreds of millimetres more rain as catastrophic ex-Tropical Cyclone Debbie moves south. Amid warnings of up to 400mm of rain over the next two days, council disaster management officials and dam operator Seqwater met yesterday to plan for threatened flooding. Almost 60 fire and emergency service personnel from NSW were being sent over the border to bolster swiftwater rescue teams stretched by the cyclone disaster in the north. Brisbane City Council has filled sandbags for collection at five depots across the city. Officials say the Gold and Sunshine Coast hinterlands, where up to 650mm of rain has fallen already this month, again face the biggest soaking. Bureau of Meteorology forecaster Matthew Bass said "very heavy rainfall" was heading southeast, from today. Mr Bass said the low-pressure system was moving southwest before looking likely to move west over Emerald, the Darling Downs and into the southeast by tomorrow night. He said falls of 150mm to 250mm were forecast across the region and rain-prone areas such as the coastal hinterlands could experience much more. Dams across Queensland are now being pushed towards and beyond full capacity. Water was being released from Somerset Dam, but Water Supply Minister Mark Bailey said it would not impact on downstream Wivenhoe Dam, which at 67.9 per cent capacity still had full flood storage. Seqwater said with a combined 340mm of rain forecast for the Wivenhoe and Somerset catchments, water may have to be released from the two dams. The southeast's overall dam levels were at 71.7 per cent ­yesterday, but are set to rise substantially. Some, like the Gold Coast's Hinze Dam, were already spilling over after last week's torrential rain and Seqwater said this week's downpour could add several months' water ­supply to the southeast. The low pressure system is expected to move off the coast tomorrow morning as coastal areas prepare for big seas. Gold Coast Mayor Tom Tate said indications were the coast may experience ­several hundred millimetres of rain that would test local roads. Cr Tate said a forecast jump in swell tomorrow was not yet a significant concern, "but we are on a watching brief". On the Sunshine Coast, the State Emergency Service was filling sandbags as residents were being warned they faced up to 300mm of rain, gale-force winds and a 500mm storm surge in the next 24 to 48 hours.